THIS BEAUTIFUL MONOGRAMMED HANKY IS ELEGANTLY SIMPLE! THE HANDKERCHIEF IS WHITE WITH A FANCY “C” MONOGRAM ALSO IN WHITE. MEASURES 14 ½” X14 ½” AND IS IN EXCELLENT CONDITION. THE ATTENTION TO DETAIL ON THIS HANKY IS OUTSTANDING! 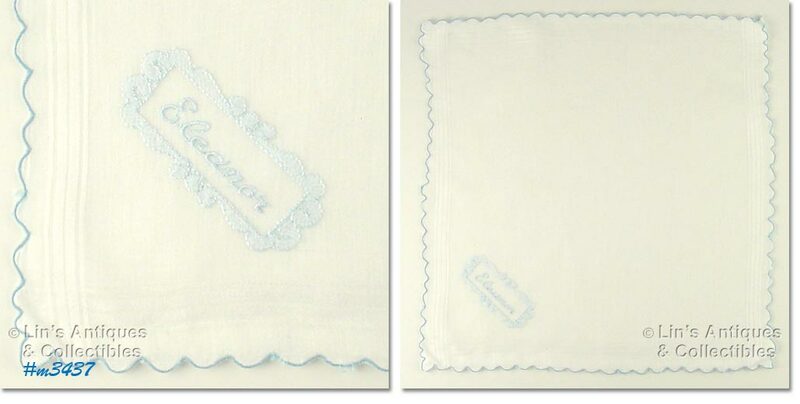 THE HANDKERCHIEF IS WHITE WITH A BLUE “M” MONOGRAM – THE BLUE STITCHING OUTLINED WITH WHITE – BEAUTIFUL. HANKY IS THE LARGER SIZE (16” X 16 1/8”) AND IS IN EXCELLENT CONDITION. 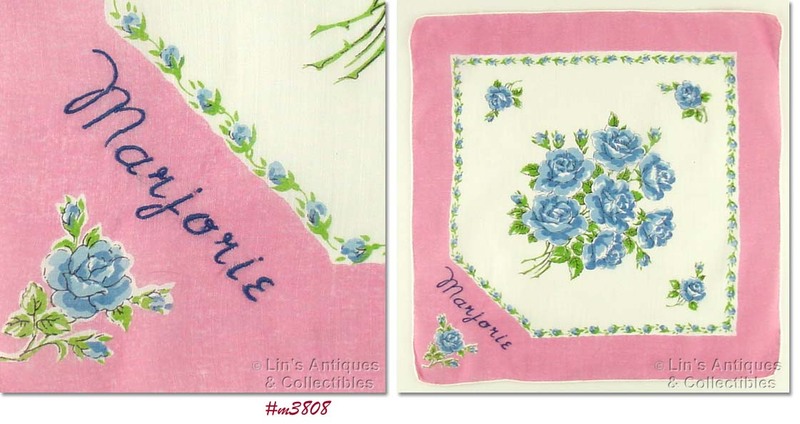 THIS IS A LOVELY HANKY MONOGRAMMED FOR MARJORIE! 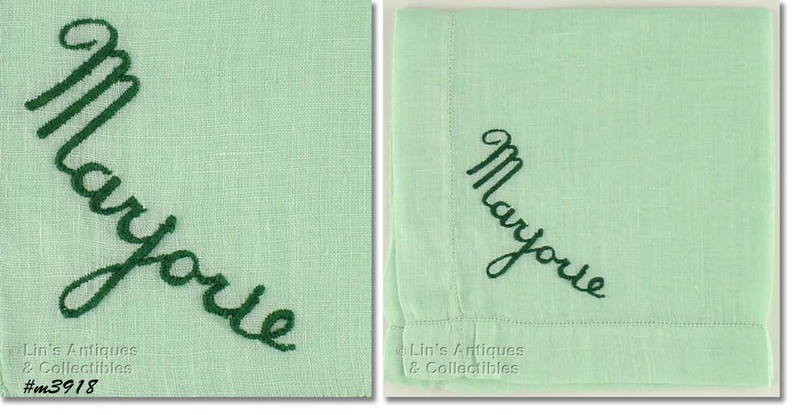 HANKY IS LIGHT GREEN COLOR AND MARJORIE IS STITCHED IN DARK GREEN. MEASURES 12” X 12 ¼” AND IS IN EXCELLENT CONDITION. THIS LISTING HAS AN EXCELLENT CONDITION MONOGRAM “E” HANKY! THE MONOGRAM IS NOT EMBROIDERED, IT’S A PART OF THE HANKY DESIGN. HANKY MEASURES 12” X 11 ¾” AND IS VERY COLORFUL! 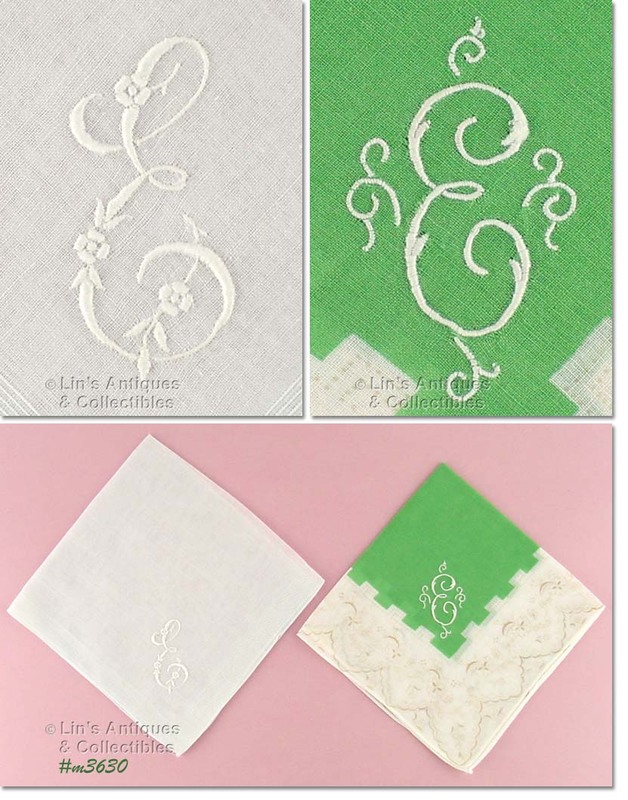 THIS LISTING HAS AN ELEGANT MADEIRA MONOGRAMMED HANKY! THE MONOGRAM IS “R’, HANKY MEASURES 13” X 13 ¼”, AND IS IN EXCELLENT CONDITION. THIS MONOGRAMMED HANKY IS BOTH LOVELY AND UNUSUAL! THE HANDKERCHIEF IS BLACK – A DIFFICULT FIND IN ITSELF – AND IT HAS AN ATTACHED NYLON FLOWER IN CORNER WITH THE “W” MONOGRAM IN THE CENTER OF THE FLOWER. HANKY MEASURES 13” X 13 ¼” AND IS IN EXCELLENT CONDITION. 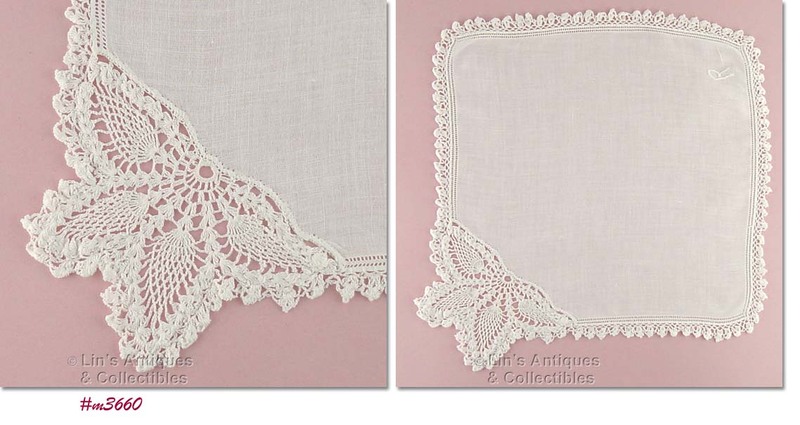 GORGEOUS AND COLLECTIBLE HANDKERCHIEF! LOVELY COLORS ON THIS FLORAL PRINT HANDKERCHIEF! IT MEASURES 13” X 13”, IS IN EXCELLENT CONDITION, AND HAS “MARJORIE” EMBROIDERED IN ONE CORNER. BEAUTIFUL MADEIRA MONOGRAM HANKY! MONOGRAM IS DONE IN LIGHT BLUE THREAD, HANDKERCHIEF MEASURES 12 ¾” X 12 ¾”, AND IS IN EXCELLENT CONDITION. THIS IS A BEAUTIFUL MONOGRAMMED HANDKERCHIEF! IT’S WHITE ON WHITE, MEASURES 13 ¾” X 14”, HAS HAND-STITCHED, HAND-ROLLED HEM, AND IS IN EXCELLENT CONDITION. ANOTHER GORGEOUS MONOGRAMMED MADEIRA HANKY! THIS ONE IS “M”, IS WHITE ON WHITE, AND MEASURES 14 ½” X 14 ½”. EXCELLENT CONDITION. GORGEOUS “L” MONOGRAM HANKY -- THE MONOGRAM IS PINK WITH PINK AND GRAY ACCENT STITCHING! HANKY MEASURES 12” X 12” AND IS IN EXCELLENT CONDITION. WOW – THIS IS A BEAUTIFUL HANKY! 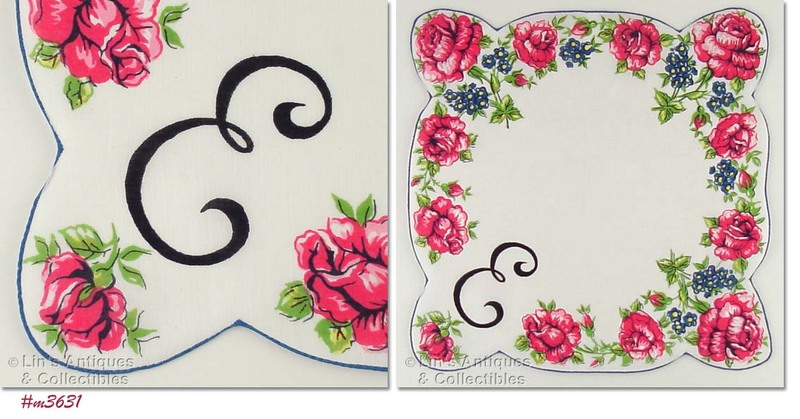 IT’S WHITE WITH FLORAL PRINT AND THE “E” MONOGRAM IS PART OF THE DESIGN (NOT STITCHED). HANKY MEASURES 12 ¼” X 12 ¼” AND HAS SCALLOPED HEM. GORGEOUS! I’VE GROUPED THESE TWO LOVELY “E” MONOGRAMMED HANKIES TOGETHER! 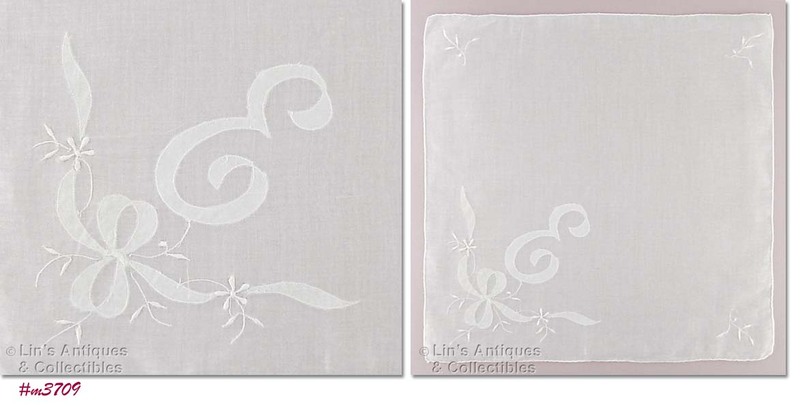 ONE IS WHITE ON WHITE, MEASURES 12 ½” X 12 ½” AND THE OTHER HAS A PRINT DESIGN WITH WHITE THREAD EMBROIDERED “E”, MEASURES 11 ½” X 12” – BOTH HANKIES ARE IN EXCELLENT CONDITION. PRETTY! THIS IS A LOVELY MONOGRAMMED HANKY – UNDERSTATED ELEGANCE! THE “M” MONOGRAM IS INSIDE A CIRCLE OF FLOWERS WITH A BASKET OF FLOWERS AT TOP. HANKY MEASURES 11 ½” X 11 ½” AND IS IN EXCELLENT CONDITION! GORGEOUS MONOGRAM HANKY! THIS ONE IS “L” EMBROIDERED IN BLUE/TEAL COLOR THREAD. HANKY MEASURES 12” X 12” AND HAS HAND-ROLLED, HAND-STITCHED HEM. LOVELY! EXCELLENT CONDITION MONOGRAM HANKY! IT MEASURES 12” X 12” AND THE “A” MONOGRAM IS PART OF THE DESIGN RATHER THAN BEING EMBROIDERED ONTO THE HANKY. 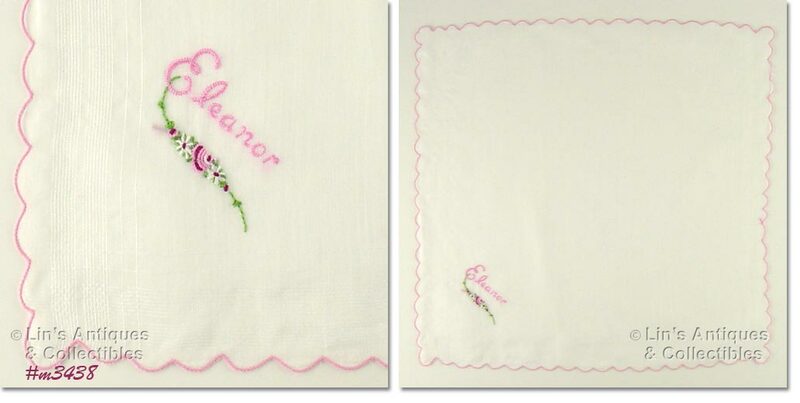 ANOTHER GORGEOUS HANKY FOR “ELEANOR”! THIS ONE IS WHITE WITH ELEANOR STITCHED IN PINK AND ACCENTED WITH FLOWERS. MEASURES 13 ½” X 13 ½” AND HAS MACHINE STITCHED EDGE DONE IN PINK THREAD. VERY PRETTY WHITE HANKY WITH BLUE STITCHED “ELEANOR” IN ONE CORNER! MEASURES 12 ¼” X 12 ¼” AND HAS MACHINE STITCHED EDGE DONE IN BLUE THREAD. BEAUTIFUL, HEIRLOOM QUALITY HANDKERCHIEF WITH “M” OPEN-WORK MONOGRAM! MEASURES 13 ¾” X 13 ¾”, HAS HAND-ROLLED, HAND-STITCHED HEM, AND THE ORIGINAL BURMEL STICKER. LOVELY! THIS IS A LOVELY MONOGRAMMED HANKY! IT’S WHITE WITH “C” MONOGRAM STITCHED IN BLUE AND ACCENTED WITH BLUE FLOWERS. HANKY MEASURES 13” X 13”. SUPER! ANOTHER BEAUTIFUL MONOGRAMMED HANDKERCHIEF! 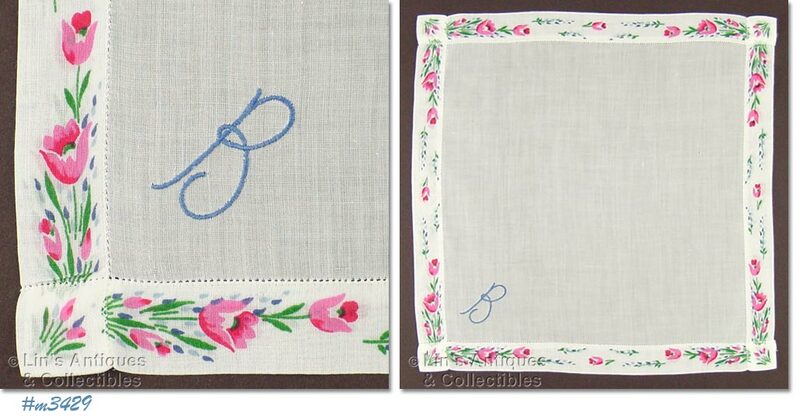 THIS ONE IS WHITE WITH A “B” MONOGRAM STITCHED WITH BLUE THREAD AND IT HAS A PRINTED FLORAL BORDER – PINK TULIPS! HANKY MEASURES 11 ¼” X 11 ½”. SUPER NICE “M” MONOGRAM HANDKERCHIEF! THE HANKY IS WHITE WITH THE MONOGRAM STITCHED IN A PALE BLUE COLOR AND IS ACCENTED WITH DAISIES AND ROSEBUDS. MEASURES 12 ¾” X 12 ¾” AND IS A GORGEOUS HANKY!